An Amtrak train has derailed in Philadelphia, Pennsylvania, leaving at least seven people dead and dozens injured as emergency workers scramble to help victims at the scene. 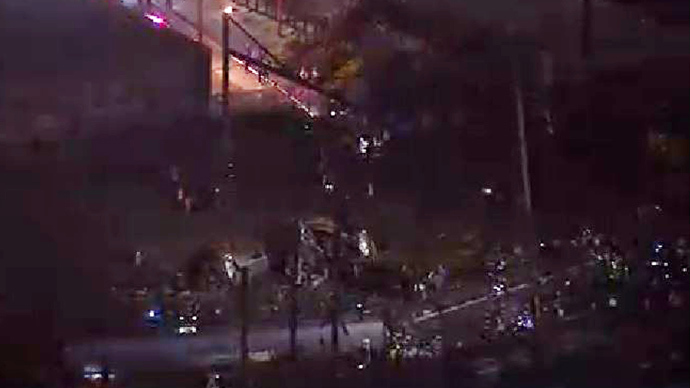 The accident occured on the Wheatsheaf Lane block, when seven cars, including the engine, on a New York-bound train derailed in northern Philadelphia. More than 65 people have been injured, officials added, with at least six in critical condition. Amtrak said that 238 people and five crew members were on the train at the time of the accident, which has been dubbed a level three mass casualty incident. Not everyone who was on the train has been accounted for. The accident is "an absolute, disastrous mess," Philadelphia Mayor Michael Nutter said to reporters. "It is a devastating scene down there." Nutter added that hundreds of police, firefighters and emergency personnel have responded to the scene. At least 10 people have been transported to Temple University Hospital's trauma unit, according to CNN. Others have been moved to Jefferson University Hospital, Hahnemann University Hospital, and Einstein Medical Center, ABC 6 reported. Nutter said that officials do not yet know the cause of the derailment. Pictures posted on Twitter by @PatrickMurphyPA - the account of former US Rep. Patrick Murphy - show emergency personnel responding to the scene. Murphy said he was onboard the train but was okay, and asked people to pray for the others involved. Another image from inside the car, meanwhile, depicted travelers with bloodied legs and faces. Video footage from NBC Philadelphia shows emergency crews using flashlights to try and remove people from inside the train. Ladders were also employed to help pull people out of the windows of a car that rolled over. Meanwhile, those who were injured were placed in emergency vehicles. Some media employees were onboard. The Associated Press' Paul Cheung said he was in the back of the train when it seemed as if it ran off the tracks. He added that the front of the train bore the worst of the damage. Janelle Richards of NBC Nightly News was also on the train. She reported that there was "a lot of smoke" and that the train was "jerking back and forth." The train was heading into a turn when the accident occurred, according to AP. All service has been suspended between New York and Philadelphia, Amtrak stated. People in the area have been advised to stay away from the crash site. The Federal Railroad Administration has sent investigators to the crash site. The FBI is also sending investigators, though it has ruled out terrorism as a cause. Pennsylvania Gov. Tom Wolf said he is in contact with authorities regarding the incident and is"closely monitoring"the situation.